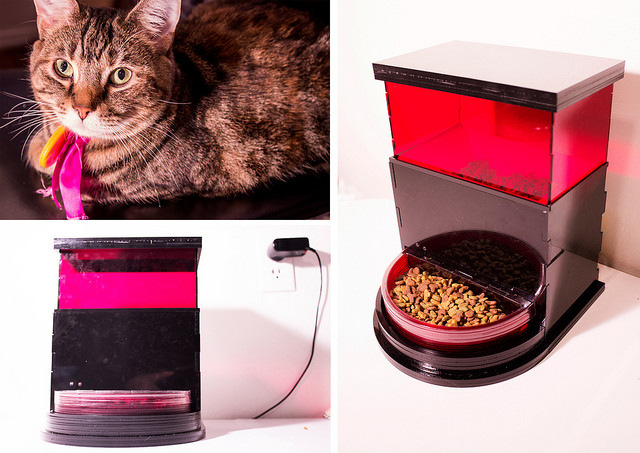 Yeliz Karadayi worked with Alex Fischer to create KibbleControl, an intelligent automated pet feeder. Using KibbleControl, a pet owner can control when their cat eats, and how much each individual cat can eat at a time. Using RFID, KibbleControl can monitor multiple cats’ feeding habits and alert their owner about what each cat eats and when. The monitoring of their eating habits also allows their owner to know if one cat is bullying another. Based on their working prototype, Karadayi and Fischer also developed a business model for an entrepreneurship class, to learn more about how to realistically visualize a product in the marketplace. The KibbleControl was created with support from a microgrant from the Frank-Ratchye Fund for Art @ the Frontier (FRFAF) — an endowment founded to encourage the creation of innovative artworks by the faculty, students and staff of Carnegie Mellon University. With this fund, the STUDIO seeks to develop a cache of groundbreaking projects created at CMU — works that can be described as “thinking at the edges” of the intersection of disciplines. Yeliz Karadayi is a first-year graduate student in the Masters of Tangible Interaction Design program in the CMU School of Architecture. Alex Fischer is a 2nd-year graduate student in the Masters of Computational Design program in the CMU School of Architecture. More information on their project, including a business plan presentation, can be found at http://yelizk.com/projects/healthcat.html.